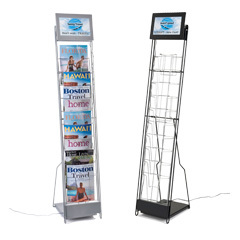 These literature racks, also called magazine stands, are the best solution when advertising periodicals larger than the standard leaflet or tri-fold publication. 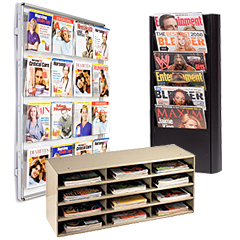 The freestanding & wall mount holders come with pockets that accommodate 8.5"w x 11"h retail or promotional materials, including weekly & monthly publications. Traditionally sized articles, flyers, comic books, company catalogs and any other type of advertisement printed on standard printer paper can be accommodated. 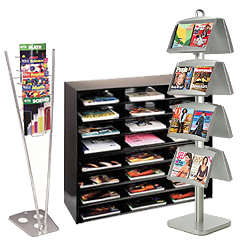 Each wholesale literature rack is an attractive presentation tool that can be ordered in a variety of styles to match the layout of virtually any modern or traditional establishment. Why include periodical displays or other catalog stands in a business? 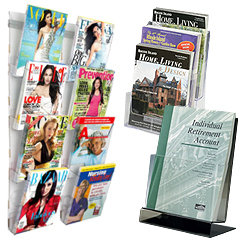 The literature racks for offices provide the most basic form of promotion within a retail store. Since the turn of the 20th century, retailers, merchants & other shop proprietors have been providing customers with catalogs detailing the latest product lines and services. Customers are able to view and review the information, especially when they can take it home with them. People are accustomed to these magazine shelves because they invite patrons to walk right up to them and check out the latest monthly or weekly articles. 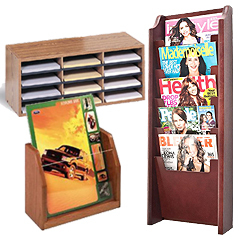 A stack of catalogs or flyers look much more attractive in the pockets or trays on this shop furniture. The shelves arrange the piles into well-organized stacks that are much more appealing to customers. The wall mount & freestanding displays allow passersby to easily see the contents and pull one from the stack. Catalogs can easily become disorganized when spread out on a table or countertop. Ensure that the printed promotions remain attractive and within easy reach throughout the day. Every business needs to maximize their advertising area. Negative space equals missed promotional opportunities. The versatility of the catalog stands allows users to place their printed materials, articles, and even comic books in any empty area, yet they require little room on the wall, countertop or floor to attract customers. Take advantage of all the possible advertising space with these display rack furniture systems. 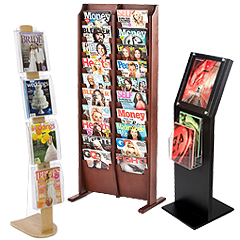 Countless shops and businesses implement periodical stands to inform potential customers. Whether the literature promotes the latest lines of goods and services or simply increases brand awareness, the wall, tabletop, and floor-standing holders are extremely effective. Entrepreneurs, managers, salespeople, in store marketers and many others implement these shelves in their establishments. Users will have no problem filling the voids with interesting promotional printed materials. 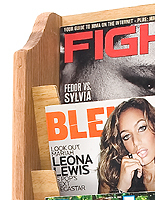 The comic racks are manufactured from many different types of materials to fit the budget and the décor. Promoters can choose from acrylic, plastic, metal, wire, and wooden options for their campaign. All of the materials are of the highest quality but are sold at affordable prices. The catalog stands come in both single and multiple pocket designs for accommodating all the necessary publications. 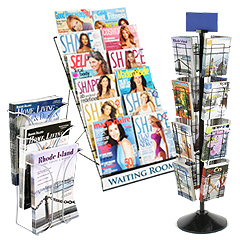 No matter which material or style of furniture is chosen, the display racks ensure that customers will see the printed materials from a distance. The attention of customers will be squarely focused on the comic books, reference articles, catalogs, flyers and other printed information. The bright images and attractive messages draw people to the fixtures. 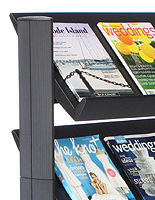 Many of the wall mount & freestanding units have a modern open front design to keep the periodicals in full view. The cardboard and some of the metal options keep the cover completely exposed. Acrylic styles are transparent, so the clientele can see the front of the publications. The modern plastic design keeps the contents securely encased but entirely visible. Each rack has a design that at least keeps the top of the 8.5"w x 11"h ad in view, so customers can see the titles at a glance. The carefully constructed holders are made to move the printed materials off the shelves. 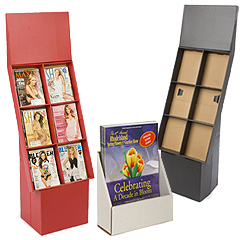 Get a plastic, metal, wire, wood, or even cardboard shelf for magazines online today!